What is contrast ratio and why do I care? 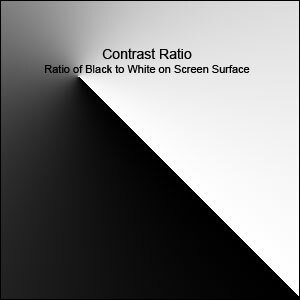 Contrast ratio in its simplest form is the ratio of the light reflected from an all white image and an all black image. So a projector with a 3000:1 contrast ratio means that the white image is 3000 times brighter than the black image. The higher the contrast ratio, the more detail you can see on the projected image whether its numbers, pictures, graphs, text, or video. Contrast is what makes it possible for us to see the subtle shades of colors. So good contrast is all about seeing the details. Although there are many electronic techniques used to increase apparent contrast, the biggest factor affecting contrast will be your classroom. Room light is the enemy of contrast. It only takes a small amount of room light to drop contrast dramatically regardless of the contrast ratio of your projector. It doesn't matter whether the projector has 10,000:1 or 1,000:1 contrast. Turn on a light and you can hardly tell the difference between them. There are four things in your classroom that will have a profound affect on contrast. Uncovered windows - cover them if you can. Lights in the room - turn them down if you can. The color of your classroom walls, ceiling and floor - the darker the better. Your screen - use a projection screen rather than a wall or chalkboard. Assuming you've done all you can for the four items above, your last weapon of defense is a bright projector. A bright projector can minimize, but not eliminate, the impact of the extraneous light sources in your room. So if this is your situation, look for a projector with high brightness (lumens).